Emeritus Professor John Patrick commenced his research career by completing a PhD at Macquarie University investigating vascular control of biomass partitioning. This was followed by a three-year postdoctoral fellowship at the University of Wales studying hormonal control of biomass partitioning. In 1973 he took up an appointment as one of the foundation academics in the newly formed Department of Biological Sciences, The University of Newcastle (UON). This provided him an opportunity to develop a long-term research program on mechanisms regulating biomass partitioning that has attracted continuous research funding to the present, primarily from the Australian Research Council. 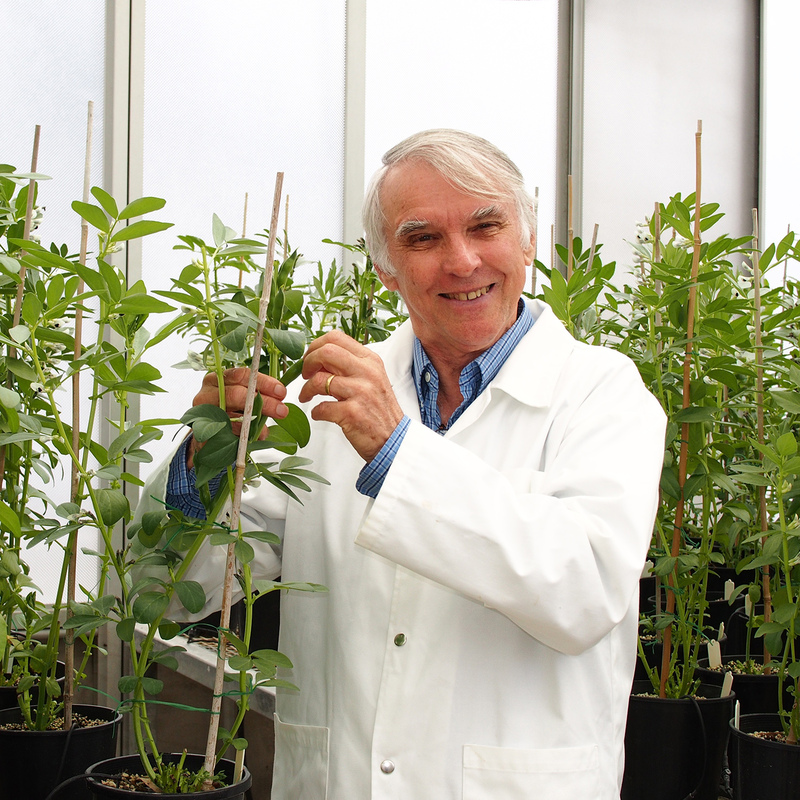 Recognition of his research achievements include promotion to a UON Personal Chair in Biological Sciences (2000) and Emeritus Professor (2008), invited to present the Sir Bob Robertson Lecture (2012), elected to Life Membership of the Australian Society of Plant Scientists (2015), recipient of the 2015 NSW Premier’s Award for Research Excellence in Biological Sciences and elected as a Fellow of the Australian Academy of Sciences (2017). On a broader scale, in collaboration with subsequently appointed colleagues, he has contributed to building research strength and capacity in the Plant Sciences at UON. Collective research achievements arising from these initiatives consistently has ranked UON Plant Science in the top bracket (ERA 5) of well above world standard in successive evaluations by Excellence in Research Australia over the past 10 years. My area of expertise is the organ physiology and cell and molecular biology of nutrient transport focused on nutrient (primarily sugars) filling of developing seeds and, to a lesser extent, fruit. To examine the underlying nutrient transport processes controlling biomass partitioning to seeds, we introduced an innovative experimental model using developing legume seeds. The model allows ready access to unambiguously study membrane transporters at the cell and molecular levels. We showed that nutrient release/uptake is mediated by specialised transport cells located at the maternal/filial interface of developing seeds. Considerable progress has been made in functionally characterising membrane transporters operating at this interface. Using in-house developed technologies, a current research program aims to clone and functionally characterise transporters responsible for sucrose release from maternal cells of developing seeds. Our transport studies highlighted a central role played by so-called transfer cells that can form at the maternal/filial interface. This has led to a parallel research program designed to discover mechanisms regulating assembly of their specialised wall labyrinth on which an amplified area of plasma membrane area is supported. The latter determines the enhanced capacity of transfer cells for nutrient transport. Our expertise in nutrient transport in developing legume seeds provided a strong information platform to undertake similar studies of cereal grains. Working along similar lines, a smaller program has addressed nutrient filling of tomato fruits that identified a translational pathway to increase fruit sugar levels. Throughout my academic career, I have enjoyed the challenge of creating and delivering undergraduate Plant Biology courses at all levels. My approach was to create an environment that empowers students to take charge of their learning process while acquiring skills including a capacity to question, to develop logical argument, to plan and undertake experiments, to critically analyse information, to integrate ideas, to think laterally and to communicate in both verbal and written forms. As a postgraduate supervisor, I am committed to offering a stimulating research environment in which research higher degree students (RHDs) progress along a trajectory to become independent and competent researchers. The training program focuses on time management, experimental design and execution, critical evaluation of the literature and their results and scientific writing and presentation skills. These skills are put into rigorous professional practise by encouraging RHDs to participate regularly in national/international conferences and to prepare their results for publication in peer-reviewed international journals. A primary focus of my service to the UON has been on spearheading initiatives to bolster research strength. These have included acquiring a LIEF-funded international standard plant growth facility (Manager: 1979-2008), developing a comprehensive RHD training program within Biological Sciences and an investment by the Faculty of Science and IT in developing a program to support and mentor earlier career academics in establishing their research careers at UON (Chair, Faculty Research Committee, Faculty of Science and IT 1999 - 2003). At a national/international level I have served as: Honorary Secretary, Australian Society of Plant Scientists (2004 - 2007); member of the ARC College of Experts, Biological Sciences and Biotechnology Panel (2004 - 2006); member of ARC Future Fellowship Panel (2008 – 2009); Member of the Advisory Board, Australian Plant Phenomics Facility (2008 - 2010); member of various external review panels of University Departments, Centres and CSIRO sub-programs; member of International Phloem Transport Conference Committee (1990 -2011); Editorial Advisory Board of the Journal of Experimental Botany (1991 - 2012); Associate Editor, Functional Plant Biology (2008 - .2012); member of FACULTY1000 (2000-present). A number of national/international collaborations are active in addressing the molecular physiology of sugar transporters and regulatory mechanisms controlling development of transfer cells. This work involved making suitable measurements to describe reliably and accurately the porous structure of coke, and the stage has been reached where the knowledge that has been gained can now be applied with advantage to the industrial situation. The intention of this paper is to quantify the description of one particular aspect of coke structure, namely the porous structure, and to demonstrate how these measurements can be used to define and describe some areas of coke quality of direct relevance to the use and production of coke for metallurgical operations. To do this effectively it is necessary to utilize a materials science approach by means of which a clearer insight can be gained of the understanding of the mechanical behavior of solid materials such as coke. © 2016 Society for Ecological Restoration. Nutrient deficiency is commonly a limiting factor in reconstructing ecosystems on disturbed areas such as mines, quarries, and construction sites. An open-cut coal mine in southeastern Australia is being used as a model to explore strategies for reconstructing a sustainable forest ecosystem on a spoil substrate. This study aimed to identify the nutrients limiting forest establishment and ways of ameliorating these. A pot trial, using two endemic Myrtaceae tree species, found that nitrogen was the most growth-limiting nutrient followed by phosphorus. To overcome these spoil nutrient deficiencies, a field trial compared the application of forest topsoil to the addition of two rates of inorganic fertilizer, gypsum, or biosolids on the response of a range of native forest plant species directly seeded into the substrate. Only biosolids significantly increased total nitrogen levels in the spoil. However, all treatments significantly decreased spoil pH, thereby increasing nutrient availability. Topsoil produced the highest plant density of native species due to contributions from its seed bank. Biosolids increased growth of Corymbia maculata. The higher rate of fertilizer addition improved seedling establishment of Mimosaceae and the survival of Myrtaceae species. High nutrient treatments increased weed and grass densities, which may have reduced the nutrient benefit for native species. In conclusion, biosolids and the high rate of fertilizer application ameliorated the nitrogen and phosphorus deficiency of spoil to support growth and survival of reintroduced native species. However, potential benefits were attenuated by competition from accompanying weed growth that could be managed by implementing a control program. BACKGROUND: Transfer cells are characterized by intricate ingrowth walls, comprising an uniform wall upon which wall ingrowths are deposited. The ingrowth wall forms a scaffold to support an amplified plasma membrane surface area enriched in membrane transporters that collectively confers transfer cells with an enhanced capacity for membrane transport at bottlenecks for apo-/symplasmic exchange of nutrients. However, the underlying molecular mechanisms regulating polarized construction of the ingrowth wall and membrane transporter profile are poorly understood. RESULTS: An RNAseq study of an inducible epidermal transfer cell system in cultured Vicia faba cotyledons identified transfer cell specific transcriptomes associated with uniform wall and wall ingrowth deposition. All functional groups of genes examined were expressed before and following transition to a transfer cell fate. What changed were the isoform profiles of expressed genes within functional groups. Genes encoding ethylene and Ca(2+) signal generation and transduction pathways were enriched during uniform wall construction. Auxin-and reactive oxygen species-related genes dominated during wall ingrowth formation and ABA genes were evenly expressed across ingrowth wall construction. Expression of genes encoding kinesins, formins and villins was consistent with reorganization of cytoskeletal components. Uniform wall and wall ingrowth specific expression of exocyst complex components and SNAREs suggested specific patterns of exocytosis while dynamin mediated endocytotic activity was consistent with establishing wall ingrowth loci. Key regulatory genes of biosynthetic pathways for sphingolipids and sterols were expressed across ingrowth wall construction. Transfer cell specific expression of cellulose synthases was absent. Rather xyloglucan, xylan and pectin biosynthetic genes were selectively expressed during uniform wall construction. More striking was expression of genes encoding enzymes for re-modelling/degradation of cellulose, xyloglucans, pectins and callose. Extensins dominated the cohort of expressed wall structural proteins and particularly so across wall ingrowth development. Ion transporters were selectively expressed throughout ingrowth wall development along with organic nitrogen transporters and a large group of ABC transporters. Sugar transporters were less represented. CONCLUSIONS: Pathways regulating signalling and intracellular organization were fine tuned whilst cell wall construction and membrane transporter profiles were altered substantially upon transiting to a transfer cell fate. Each phase of ingrowth wall construction was linked with unique cohorts of expressed genes. © 2015 Nature America, Inc. All rights reserved. As there are numerous pathogen species that cause disease and limit yields of crops, such as wheat (Triticum aestivum), single genes that provide resistance to multiple pathogens are valuable in crop improvement. The mechanistic basis of multi-pathogen resistance is largely unknown. Here we use comparative genomics, mutagenesis and transformation to isolate the wheat Lr67 gene, which confers partial resistance to all three wheat rust pathogen species and powdery mildew. The Lr67 resistance gene encodes a predicted hexose transporter (LR67res) that differs from the susceptible form of the same protein (LR67sus) by two amino acids that are conserved in orthologous hexose transporters. Sugar uptake assays show that LR67sus, and related proteins encoded by homeoalleles, function as high-affinity glucose transporters. LR67res exerts a dominant-negative effect through heterodimerization with these functional transporters to reduce glucose uptake. Alterations in hexose transport in infected leaves may explain its ability to reduce the growth of multiple biotrophic pathogen species. This study is concerned with assessing a commercial MoO3-NiO/Al2O3 (Akzo 153) catalyst which had been used in a coal-liquid upgrading process for 400 h, to promote low-severity coal hydrogenation. Such a reaction system is considered to be practically economic. A tubing bomb microreactor (25 cm3 capacity) was used for dissolution reactions of a low-rank British bituminous coal in an industrial recycle solvent under various conditions. Results show that this catalyst &apos;waste&apos; exerts considerable influence on the coal hydrogenation reactions, although its activity is reduced, compared with a fresh sulfided catalyst of the same type. This research has also improved understanding of the catalysed coal hydrogenation mechanisms and has identified a potentially beneficial method of disposal of industrial catalyst wastes. Copyright © 1996 Elsevier Science Ltd.
Vitrains hand picked from a rank series of British coals were carbonized to various temperatures between 300 and 1000 °C. The semicokes and cokes so produced were subjected to chemical analysis, and determinations of crystallite size by X-ray diffraction, reflectance properties and of optical texture composition by polarized-light microscopy. Consideration of the chemical and physical data in relation to the optical anisotropy showed association between the development of the optical anisotropy and the loss of volatile matter, and between the formation of the different anisotropic entities and different carbon contents. The composition of the parent vitrain is the prime factor controlling the anisotropic texture developed during carbonization, and the changes in the physical properties can be interpreted in terms of increasing molecular order and size as mosaic anisotropy grows in grain size through to flow-type anisotropy. © 1991. Until recently a suitable experimental system to study sugar unloading from the phloem was not available. Now it is possible to gain a greater insight into this important process using excised seed-coat halves of bean. The technique is described along with three experiments illustrating important characteristics of sugar unloading. Full details of methods are given although the article can be used simply to introduce students to current terminology in phloem physiology, typical14CO2-dosing techniques in plant studies, and the complex nature of sugar transport across the plasma membrane. Abbreviations: BAP = 6-benzylaminopurine; CCCP = carbonyl cyanide m-chlorophenylhydrazone; MES = 2N-morpholino]ethanesulfonic acid; PPO = 2, 5-diphenyloxazole; TRIS = tris (hydroxymethyl) methylamine. © 1989, Taylor & Francis Group, LLC. All rights reserved. Phloem transport in stems of Phaseolus vulgaris was found to be sensitive to treatment with the auxin transport inhibitor, 2,3,5-triidobenzoic acid (TIBA). The response was dependent on the concentration of TIBA applied. A concentration of TIBA (0·5% in lanolin) which did not interfere with normal phloem transport proved inhibitory to both basipetal transport of IAA and the acropetal component of IAA-promoted metabolite transport. In contrast, both acropetal IAA transport and basipetal IAA-promoted metabolite transport were unaffected by TIBA treatment. The inhibitory effect of TIBA on acropetal IAA-promoted transport was overcome by providing IAA below the point of TIBA application. Both acropetal and basipetal IAA-promoted transport in stem segments were unaccompanied by any corresponding changes in the accumulation of [14C]sucrose by the segments. © 1978 Oxford University Press. The hypothesis that indol-3yl-acetic acid (IAA) stimulates solute mobilization in stems by increasing metabolite utilization (i.e. sink strength) and/or sieve tube unloading mechanisms was investigated using seedlings of Phaseolus vulgaris L. Sink strength was assessed by obtaining estimates of rates of growth, 14C incorporation into protein, sucrose metabolism, and sucrose uptake. The data obtained suggest that, whilst enhancing assimilate mobilization, IAA had no short term effect on the sink strength of the treated stumps. In several experiments involving long distance transport of 14C-assimilates, the magnitude of auxin-promoted transport was found to be insensitive to potential changes in sink strength. Furthermore, 14C transport profiles demonstrated that the site of hormone action was not confined to its point of application. © 1976 Oxford University Press. Indol-3yl-acetic acid (IAA) applied to sterns of Phaseolus vulgaris seedlings, decapitated above primary leaves, enhanced the mobilization of 14C-metabolites to the treated stumps and this effect was apparent within 3-6 h of applying the hormone. More than 90 per cent of the total 14C-activity transported to the stumps was detected in the alcohol-soluble extracts. In all treatments, less than 5 per cent of the 14C-photosynthate exported from the primary leaves was translocated upwards. Accumulation of 14C-activity was also increased when the IAA was applied laterally to intact internodes. This effect was obtained when 14C was supplied either above or below the point of hormone application. By selective heat girdling, it was shown that the auxin affected 14C transport when either the root &apos;sink&apos; was removed or transpiratory flow of water through the treated internode was maintained. Decapitated stems treated with plain lanolin for 3 d were found to retain their responsiveness to auxin in terms of enhanced metabolite transport. Heat-girdling experiments and estimates of 14C transport velocity suggested that most of the 14C movement was restricted to the phloem of treated stumps. Similar effects of IAA on a transport in excised stem segments of Phaseolus vulgaris were observed. © 1973 OXFORD UNIVERSITY PRESS. Physiological amounts of indol-3yl-acetic acid (IAA) were accumulated by decapitated stems of Phaseolus vulgaris L. seedlings from lanolin pastes, containing 0.1 per cent IAA, applied to the cut surfaces of the stumps. Both the levels and gradients of extractable and diffusable IAA detected in the treated stumps compared favourably with those reported for the whole plants. A considerable portion of IAA that entered the tissue was metabolized to a compound that had chromatographic properties similar to indol-3yl-acetylaspartic acid. Two other metabolities were tentatively identified as indol-3yl-acetylaspartic acid indol-3yl-acetylglucose. The accumulated IAA appears to be transported as indol-3yl-acetic acid at an apparent velocity of 28 mm/h down the decapitated internodes. © 1973 OXFORD UNIVERSITY PRESS. The aim of this work was to determine the influence that an advanced demineralisation procedure has on the combustion characteristics of coal. A high-volatile bituminous coal with 6.2% ash content was treated in a mixture of hydrofluoric and fluorosilicic acids (HF/H2SiF6). Nitric acid was used either as a pretreatment, or as a washing stage after HF/H2SiF6 demineralisation, with an ash content as low as 0.3% being attained in the latter case. The structural changes produced by the chemical treatment were evaluated by comparison of the FTIR spectra of the raw and treated coal samples. The devolatilisation and combustibility behaviour of the samples was studied by using a thermobalance coupled to a mass spectrometer (TGA-MS) for evolved gas analysis. The combustibility characteristics of the cleaned samples were clearly improved, there being a decrease in SO2 emissions. © 2002 Elsevier Science B.V. All rights reserved. For a series of metallurgical cokes covering the range encountered in industrial practice, the tensile strength, as determined by the diametral-compression test, has been considered in relation to aspects of the porous structure. By means of reflected light microscopy and a computerised image analysis system a quantitative characterisation of the porous structure was made in terms of the number, shape and size of the pores in chosen size categories. It is found that for metallurgical cokes in general, no single structural parameter gives a good correlation with the tensile strength. More complex relationships using composite terms involving several of the structural parameters can be derived and these lead to correlations of high statistical significance. The data are discussed with reference to other published work on the relation between the strength and structure of similar materials. UON's Emeritus Professor John Patrick has been elected as a Fellow of the Australian Academy of Science.